On leaving the Mercury Islands we couldn't believe our luck to find that for the 3rd day running the wind was going to be from the southeast, giving another downwind passage. So it was the two genoas up again and we were making 7- 8kts in a wind of 20kts. The forecast was for the winds to increase during the day to 25k, gusting 35kts. Not what we wanted to hear, but the forecast for the next few days, with the big tropical storm coming down, is far worse, giving 25 to 30kts, gusting to over 40kts. The forecasters still can't make up their minds on which direction this storm will take, but it looks like the winds will start increasing on Sunday night and go higher on Monday and Tuesday. They're also predicting 70mm of rain during Tuesday, so it's going to be both windy and soggy! An added complication is that in addition to the low pressure system coming down from the tropics, another low is forming in the Tasman sea and also heading for New Zealand at about the same time. If these weather systems combine over New Zealand, it could be quite a storm. 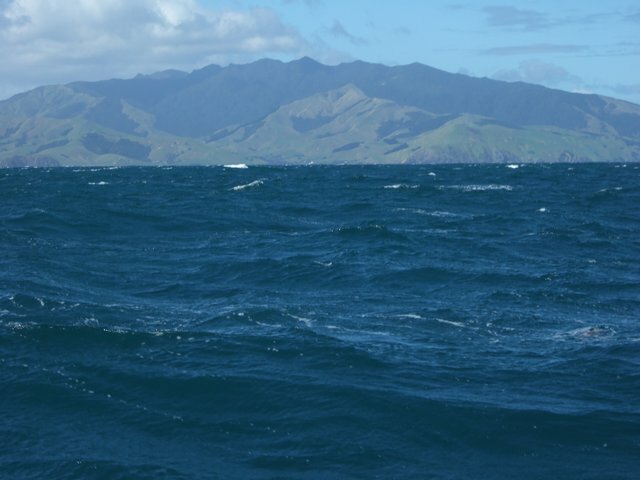 On going through the Colville Channel, the wind increased to a steady 30kts and the seas started to churn - short, sharp and confused - lumpy would be an understatement! 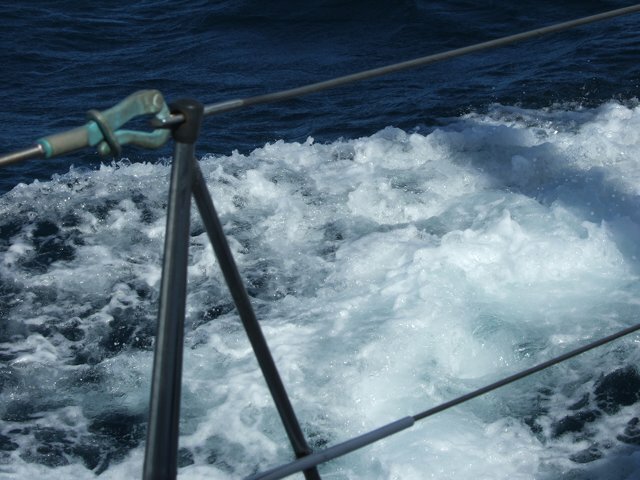 With a just a scrap of sail up we were continuing to make 7 - 8kts and there was always the concern that one of the rogue waves might find its way on board. Despite the conditions, it was a pretty comfortable ride most of the time, but cross seas every now and again caused a significant roll, first one way and then back the other. These are the moments when you're glad you spent the time tying everything down. 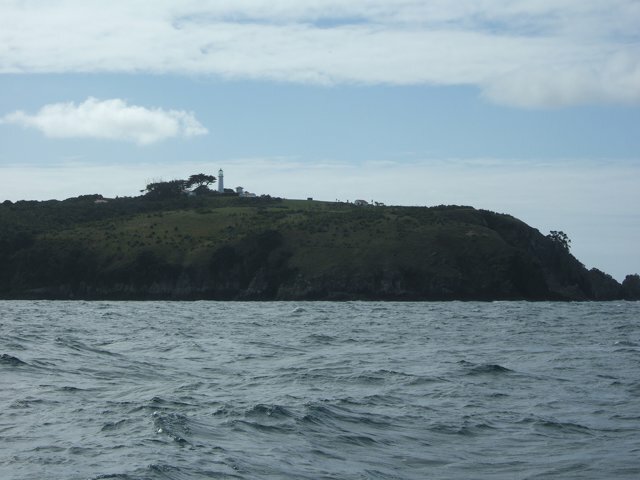 However, once halfway across the Hauraki Gulf the wind dropped back to 20kts and the seas calmed down, so up went more sail and we maintained 6 - 7kts. 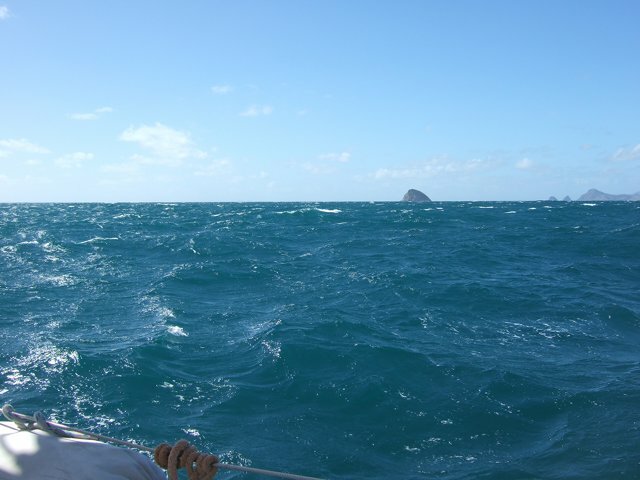 The last 3 days have been a good re-introduction to ocean sailing. We never expected to use poles, but have used them every day. So lots of good practice. on, the conditions started to deteriorate. White water as Aurora B ploughs through the short sharp seas. Channel Island in the distance - high winds and quite rough seas. 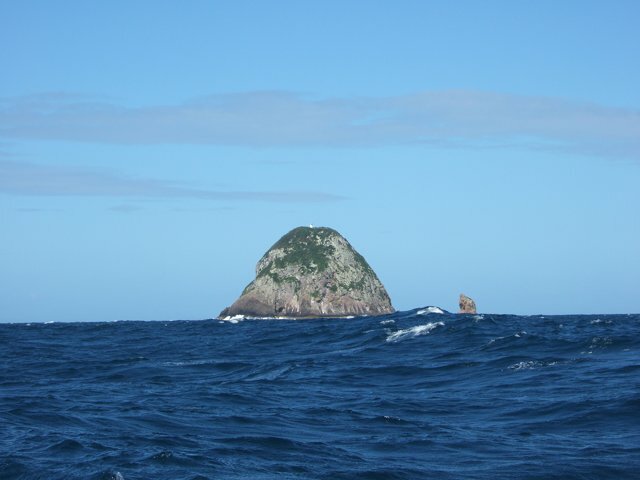 Cape Colville - marking the northern end of the Coromandel Peninsular.